He was born on the 18th October 1800 in the north eastern village of Bishop Middleham. While still in infancy Henry’s mother died and his father George remarried, but not until Henry was 18 years old. George had friends in London who could find positions for three of his sons. Unfortunately typhoid was endemic at the time and Henry lost both of his brothers to the disease. As a means of escaping the sickness he accepted the offer of a post in Barbados. This overseas posting did not last too long though and he was back in England by October 1823. He had been engaged on the pressing issue of the abolition of slavery and Taylor worked tirelessly to bring it about. While he was, undoubtedly, a busy civil servant, he still found the time to write poetry and articles, styling his verse on that produced by Lord Byron. He had work published, initially, in such magazines as the Quarterly Review and the London Magazine. His father already counted William Wordsworth amongst his friends and, during a visit to the Lake District, Taylor also struck up a relationship with the famous poet’s family. Additionally he was friendly with Robert Southey, another well-known writer of the time. This was the start of his ever-growing circle of literary friends and acquaintances which also included John Stuart Mill, James Stephen and Thomas Hyde Villiers along with many others. Mill introduced Taylor to the philosopher, mathematician and writer Thomas Carlyle towards the end of 1831 and Carlyle described him as displaying qualities of “marked veracity”, meaning that Taylor was keen on honest detail and factual accuracy. This opinion was, however, misquoted in one publication and it read that Taylor’s character was one of “morbid vivacity”. He took an interest in documenting the life of Robert Southey and, when declaring himself official biographer, he occasionally encountered problems with members of Southey’s family. He did, however, become literary executor following the writer’s death. Taylor produced a number of plays of his own such as Isaac Comnenus, written in 1827. When he penned Philip van Artevelde in 1834 comparisons were made between this and some of the work of William Shakespeare. Taylor married into a noble Irish family when, at the age of 39, he took the Hon. Theodosia Alice Spring Rice as his wife. She was the daughter of the 1st Baron Monteagle of Brandon. 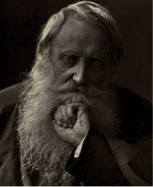 Sir Henry Taylor died on the 27th March 1886 aged 85.